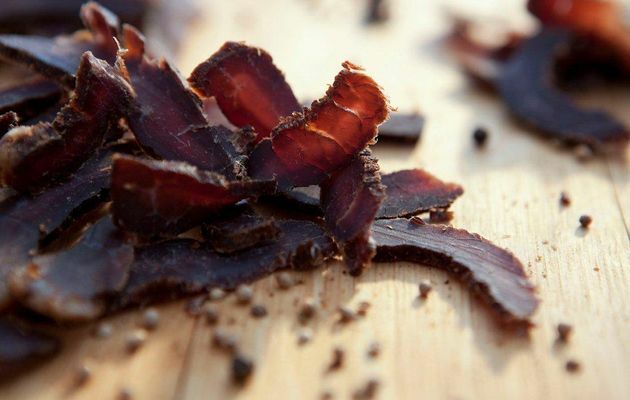 The history of biltong goes back hundreds of years and is rich in folklore. The history of Biltong is a rich inheritance from our forefathers. The word BILTONG is derived from the words “BIL” (BUTTOCK) or meat and ‘TONG” or strip. So it is just a strip of meat. For centuries mankind has endeavoured to preserve meat. Seafarers, centuries ago, pickled meat in large wooden caskets and devoured this during the months they were at sea. No wonder they suffered from scurvy!! African folklore has it that migrating African tribesmen, herding their stock, would place strips of venison under the saddles on their horses as the chaffing would tenderise the meat and the sweat of the animals would spice it! This must be when vegetarians were born!! There is nothing like real South African Biltong and…. you can make it yourself! BILTONG as we know this delicacy today, is a rich inheritance from pioneering South African forefathers who sun dried meat during their trek across the African Subcontinent. The basic spicing is a dramatic blend of vinegar, salt, sugar, coriander and other spices. These were in abundance in the then Cape Colony, as the French Hugenots produced wine and vinegar from their grape crops and the colony was the halfway stop for seafarers plying the spice routes of the East. Various brine recipes and marinades were created and handed down for generations! Today BILTONG and DROE WORS (dried South African sausage) is a massive industry and the most sought after delicacies in Southern Africa. Today Biltong is made by hundreds of thousands of private people worldwide as a way to have access to this South African delicacy. Massive Biltong Factories and thousands of small and medium home industries have sprung up to satisfy the enormous market there is for biltong everywhere.